Mines throughout Pennsylvania contain millions of gallons of contaminated water, putting thousands of stream miles at risk. At the same time, the oil and gas industry needs large volumes of water for well development and hydraulic fracturing. New legislation and new technology may soon provide a solution for both of these challenges. In October, Pennsylvania Governor Tom Wolf signed Senate Bill 875 into law as Act 47, the Treated Mine Water Act, to encourage the use of treated mine water in natural gas drilling in Pennsylvania. The new law allows oil and gas companies to use and transport acid mine drainage (AMD) without the threat of liability for cost, injury or damage arising from its use. 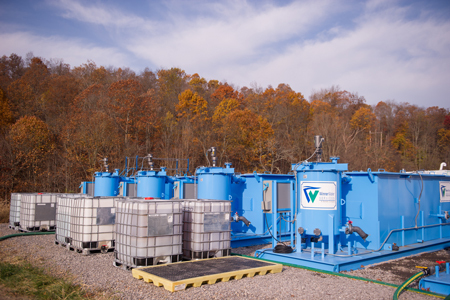 An innovative water treatment method already in use at a demonstration project in the Commonwealth makes it possible to remove metal and sulfate contamination from AMD to make the water usable for oil and gas applications. Toxic water from mining can be discharged into the local environment and carried miles downstream to lakes and reservoirs far removed from the original source of contamination. Impacted streams can sometimes have a pH similar to that of battery acid, low enough to burn human skin and kill fish and other aquatic life. At the same time, water use has become flash point for hydraulic fracturing and other water-intensive industrial processes. A single gas well can use up to 5 million gallons of water between initial fracturing and well completion. Using AMD instead of freshwater allows drilling companies to reduce their environmental footprint significantly and diminish friction with local communities. Done right, using AMD for hydraulic fracturing could be a win-win for developers and the environment. Prior to passage of Senate Bill 875, these waters were legally and politically toxic. Under the Commonwealth’s Clean Streams Law, companies wanting to clean and use mine water for other purposes could potentially be held liable for cleaning up the site in perpetuity, even though they were not responsible for the initial contamination. While repurposing water from coal mines for oil and gas development has been in discussion for years, liability concerns have discouraged the industry from moving forward. 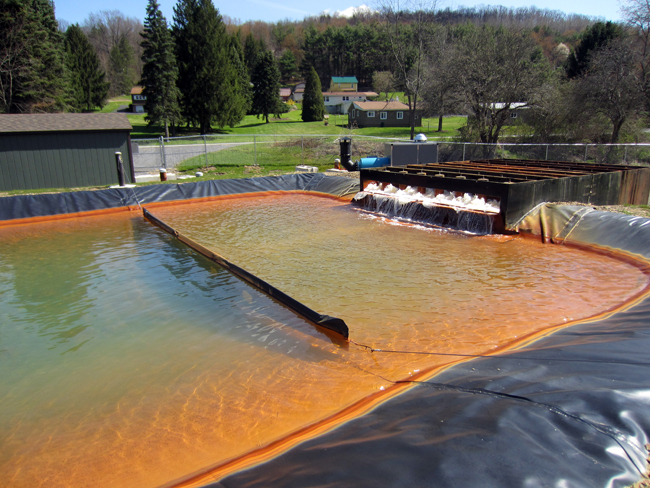 Treated acid mine drainage water from Winner Water Services’ Sykesville, PA, site is available for immediate use by oil and gas operators and other industrial users. Pennsylvania Department of Environmental Protection authorized Winner Water to treat, store, withdraw, and sell water from the Sykesville facility without liability for further treatment under the Clean Streams Law. The new law opens the door for treated mine water to be substituted for fresh water for oil and gas well development, potentially conserving millions of gallons of fresh water. According to the law, companies will be immune from liability related to the use of AMD as long as it is: 1) used outside of the boundaries of the permitted mining activity site, 2) used for oil and gas development, and 3) the mine operator is not the same entity using the treated mine water for oil and gas well development. Contaminated mine water cannot be used as-is, however. In order to make mine water usable for hydraulic fracturing or other industrial purposes, it must first be treated to remove both heavy metals and sulfates. Many AMD treatment options remove only metals, leaving behind high levels of sulfates that can interfere with fracking fluid chemistry. Conventional precipitation methods generally are not able to reduce sulfate concentrations below 1,400 mg/L. Membrane-based processes are more effective, but are very costly and generate a large waste stream. However, a new technology is now available that can economically and effectively remove both metals and sulfates from contaminated mine water in one process. 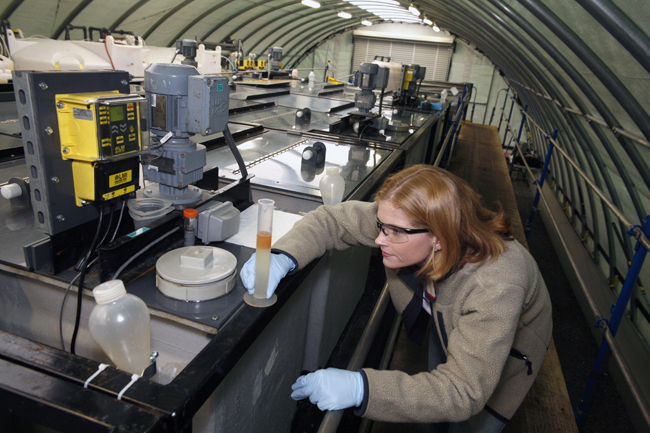 HydroFlex™ is a water treatment platform developed by Winner Water Services, a subsidiary of Battelle. In a demonstration project underway at Fawn Mine in Sarver, Pa., HydroFlex has been shown to reduce sulfate concentrations by up to 90 percent. The HydroFlex platform simultaneously recovers contaminants for value while generating consistently abundant and high-quality water for oil and gas operations, without producing landfill sludge. HydroFlex can help the oil and gas industry take advantage of the opportunities presented by Senate Bill 875. By turning AMD into a usable resource, the industry is cleaning up an environmental problem and reducing fresh water use at the same time. That’s a solution with long-reaching positive impact for industry, local communities and the environment. Carolyn Kotsol is president and CEO of Winner Water Services, a Battelle company. Winner Water Services treats acid mine drainage for industrial uses at its Sykesville and Sarver, Pa., locations.